Everyone is so excited to attend the Rockhampton River Festival, brought to us by the Rockhampton Regional Council. Don’t forget public transport is a reliable, parking free option for the Rockhampton River Festival. 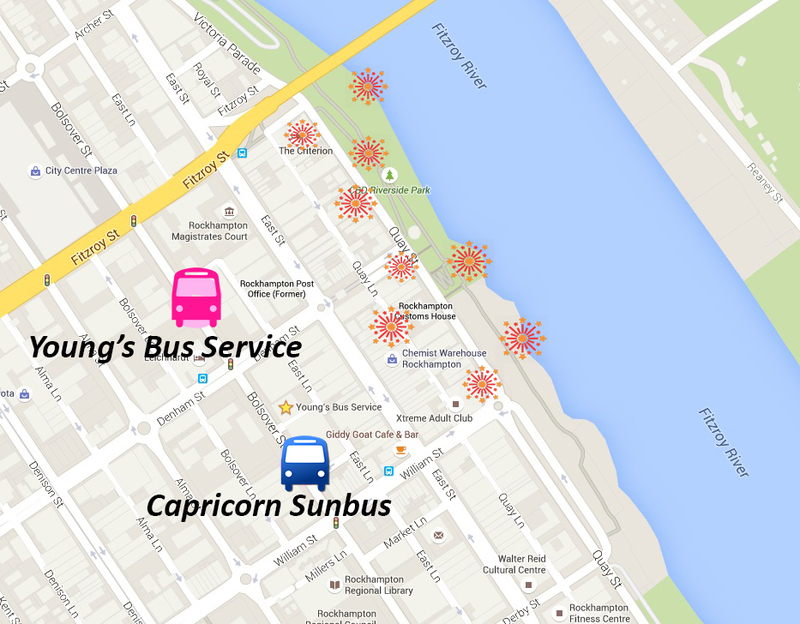 Convenient bus stops at the Kern Arcade and outside the Rockhampton Police Station in Bolsover Street are just a short walk to Quay St and all prime locations of the Rockhampton River Festival. Both Rockhampton urban (Capricorn Sunbus) services and Rockhampton regional (Young’s Bus Service) services provide public access for both Rockhampton residents and those of Mt Morgan, Gracemere, Keppel Sands and the Capricorn Coast. For those who can’t walk long distances Young’s Bus Service operates disabled services via the routes 20, 21, 22 and 23, dropping off and picking up at the Bolsover Street Bus Stop over 75 times a day through-out the festival. That’s close proximity and incredible access to this inaugural Rockhampton event. For the healthy, eco-friendly and stress-free option travelling to the Rockhampton River Festival use public transport. Young’s Bus Service Timetable, your bus service. Bus services will not be affected by the road closures for this public event. Specific road closure information can be viewed here.